STORY: You are a colorful being full of potential and good, you travel to a colorful city full of opportunities where everything is possible. When you are about to enter, you make a shocking discovery that everything has changed for the worse... 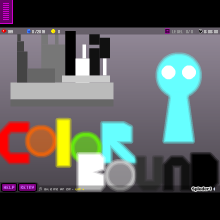 Journey into the city in search of the truth and stop the despair within... ~~~~~~~~~~~~~~~~~~~~~~~~~~~~ HOW TO PLAY: Color Bound is a point-and click game where you can point objects with the mouse and click them to place certain events. Move your character with the arrow keys (the character is clickable as well). TYPES OF PEOPLE: Dark beings: chaotic and full of hatred, don't touch them. Grey beings: Hopless beings that have given up on life and don't know what to do. Harmless. Light Beings: supportive and haven't given up yet, touch them to give you extra life. Colorful beings: Beings that haven't given up yet and have the determination to keep going (such as you). Clickable and controllable characters that have special abillities.